If you’re looking for the archetypal « land of milk and honey », this island, with its strong character, is surely it, with every season leaving its mark on the contours of a land which remains remarkably unspoilt. 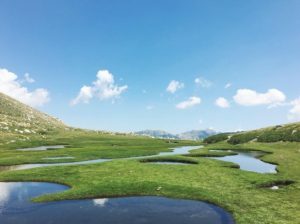 With close to 1,500km of marked footpaths and over 1,350 beds available in its stopover gîtes and mountain refuges, the Parc Naturel Régional de Corse offers superb hiking opportunities as well as the chance to discover rare fauna and flora, including over 2,000 different plant species. 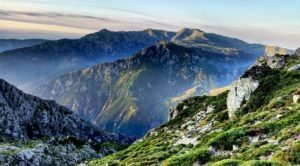 Experienced hikers can stride out along the marked trails of the GR20 long-distance path; conquer the summits of the Aiguilles de Bavella; or plunge into the natural pools of the Gorges de la Restonica. Yet, despite their grandiose appearance, these majestic landscapes are often easily accessible, with surprises at every turn, and whether you‘re with family or friends, your favourite outdoor pursuits provide the ideal way of exploring these wild and pristine areas. As a reward, why not treat yourself to a delicious platter of seafood at the foot of a snow-clad peak — a uniquely Corsican experience which sums up to perfection its extraordinary combination of sea and mountains. Corsica is an island of superlatives where mountains, escarpments and freshwater lakes framed by towering peaks provide a majestic backdrop. The island is much more than a mass of rocks fringed by idyllic beaches: it is a mountain jewel set in the middle of the Mediterranean, and to discover its true heart you’ll need to conquer the GR20 long-distance path. Considered one of the world’s most beautiful hiking trails, this route crosses Corsica from north to south and encompasses Mount Cinto, the « roof of Corsica », at an altitude of 2,710m. Stride across the rocky mountains of the north of the island before tackling the peaks in the south. Cross the Massif de Bavella and discover the « Trou de la Bombe », a huge natural excavation eroded out of a granite wall; climb up to the Capitello breach from where the views encompass deepwater lakes; or scale the summit of the impressive Mount Incudine. For visitors keen on competitive hiking, spring is the ideal season. Why not enter the « Foulées Cortenaises », or the Corsica Raid Aventure with its numerous categories covering a range of activities. Perhaps stride out along the « Mare a Mare » hiking path which runs from Pono-Vecchio to Propriano through the heart of the Alta-Rocca region. This route plunges into the very depths of Corsica with an azure-blue sea at either end. Or test yourself with the « Mare e Monti » experience, a trail linking Calenzana with Cargèse. 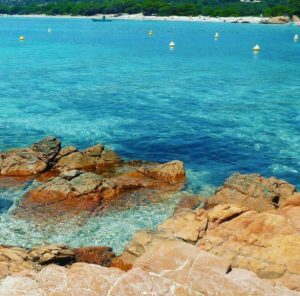 With either of these walks, you’ll really feel as though you’re experiencing the hidden Corsica. After such intense effort, reward yourself with a few hours rest in an impressive refuge, often sculpted out of the rock, where you can refresh yourself with the purest water you‘re ever likely to taste!